Hillary Clinton is the top choice when people are asked which major 2008 presidential candidate would make the scariest Halloween costume. Thirty-seven percent in an AP-Ipsos survey this month chose the New York senator. Fourteen percent selected former New York Mayor Rudy Giuliani. 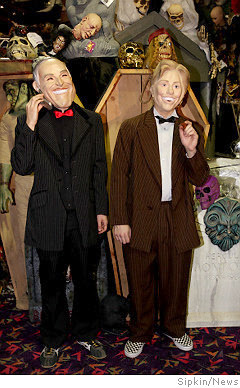 These costumes aren't so scary today but could really be frightening next year if they represent our presidential choices. What is really scary about the two candidates and the analogy of the masks, is that like masks, these two candidates are interchangable in the way that Hillary can be viewed in so many ways as a neo-con and Giuliani as a liberal. What is a voter to do? "What is a voter to do?" Praying and voting. Vote, every time, never not vote.